For all readers of "Symphonic Metal for Dummies" I have a good advice. 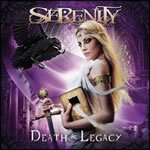 Order a copy of Serenity's third full-length album Death & Legacy and you won't have to look further for a more symphonic metal album. On their sophomore release, 2008's Fallen Sanctuary, the band introduced itself into the big league of symphonic metal. On this new work, their position is easily confirmed, if not extended. The subjects of this concept album are the stories of Christopher Columbus, Giacomo Casanova, Sir Francis Drake, Marco Polo, Queen Elizabeth I, Maria Stuart and a few more well known historical figures from years past. These are subject perfect for this kind of music. After the first spin, Death & Legacy seems overwhelming, caused by a relentless symphonic storm that rages on throughout the entire album, and underlined by the 70 minute playing time. However, as with most things in life, experience doesn't come easy. After a few more spins the feeling slowly changes to habituation and eventually to admiration. Death & Legacy offers 16 new songs but going track by track is useless, since it goes from one highlight to another. However, if one particular track tells the whole story of this album, it would be Changing Fate. A fantastic semi-ballad with a great build up, solid (solo) guitar work, stunning melodies, beautiful vocal harmonies which are drenched in heavy symphonic arrangements. Nevertheless, the overall impression of this album is one of solid song writing, great consistency, loyalty to the concept, and flawless production. Partly responsible for the atmosphere is co-producer Oliver Philipps, the mastermind behind German melodic rockers Everon, who took care of Death & Legacy's orchestral production. Immediately I realize, once more, why I like his work with Everon so much. (By the way, where is the follow up to the fantastic North, Oliver?). There is only a slight downside here. In the pursuit of perfection Serenity seems to have lost a little spontaneity that was so prominent on Fallen Sanctuary. Nevertheless, the trade of with the epic and bombastic flow of the album and the inspiring and fitting guest vocals by Charlotte Wessels, Ailyn, and Amanda Sommerville make you forget about that quickly. To what extent Death & Legacy is remembered for its prevailing subject matter is left in the hands of time. For now, they are ready to be champions in the league of symphonic metal. Forget about your savings. Get this one ASAP. On their sophomore release, 2008's Fallen Sanctuary, the band introduced itself into the big league of symphonic metal. On Death & Legacy, their position is easily confirmed, if not extended.